It’s that time of year again; romance is in the air and you’re in the mood to watch something fitting. Paris is lovely at night (and I can vouch for it), so why not see it from the comfort of your own home? A screenwriter reflects on his life by taking magical midnight walks through Paris. I can’t say I’m well-versed in Woody Allen’s work. I’ve only seen Annie Hall before this and that was some time ago; Manhattan is sitting on my shelf. My film club had scheduled this for the Valentine’s Day movie. I caught this with a mutual friend on Blu-ray and the format alone makes a big difference in how it’s viewed. The thing with this film that I found was that it took its time to get you invested. I had read the description on the case and, after seeing the film, discovered that it was very vague and withheld one of the film’s major plot devices: time travel. Yeah, I didn’t realize that this was something until the first encounter with Hemingway and Fitzgerald. My friend and I thought it was just a strange occurrence after a night of drinking. It was clear from early on that Gil’s company was not exactly the best kind of company to keep. I choked on their dialogue at parts because it was on the border of being pretentious. I’m not against having intellectual conversations but I enjoy them every now and then. The cinematography is beautiful. Just looking at the color palette, there’s a nice warm feeling from the lights. Seeing it on Blu-ray has a better range of values and enhances the whole mood of film. This was nominated for Best Picture, but lost to The Artist. From the nominees I’ve seen in that category, this was one of the better films. However, it seems like this was long shot and was used to fill in the rest. At the end of the film, I tried to figure out who I would show this to in the future. I don’t know at this point. I’ll keep it in mind if and when the opportunity arises. I’d like to have some more of his films under my belt before I can recommend this. At least the trip to the Moulin Rouge isn’t as frenzied as the Baz Luhrmann version. If you ever get the chance, go see Paris for yourself; it’s very lovely. This film is probably the next best thing. A robot who has developed emotions finds a plant and helps bring humanity back home. This was one of the few movies my entire family saw in the theaters when it was released. From what I can remember, it was a good experience and eventually my autistic brother got it for Christmas years ago. Over time this movie eventually moved to the movie collection in our basement, only to be retrieved whenever I felt like watching it. 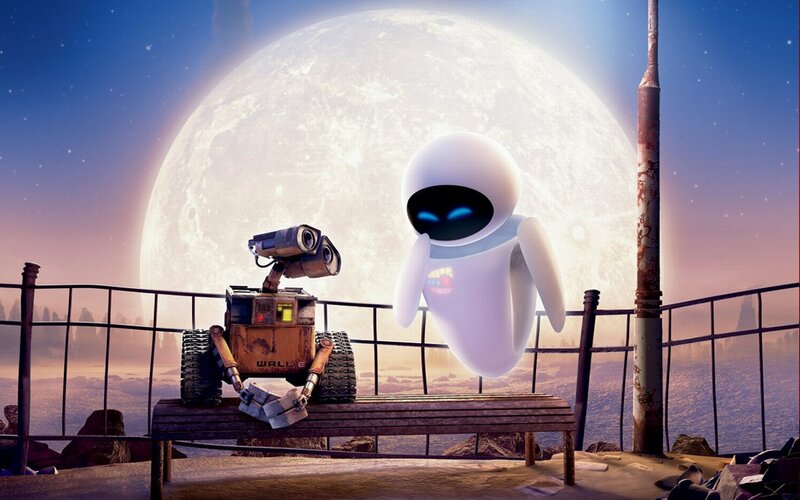 I enjoyed the first half where it was just WALL-E and EVE with minimal dialogue. I cannot remember the last time an animated film started off without dialogue from our protagonist for a noticeable amount of time. Looking back, it reminds me of when I saw some silent films with a large crowd that included children. They connected with WALL-E the same way they did with Buster Keaton or Harold Lloyd. The themes of commercialism and the culture of consumerism was not lost on me. I laughed at the superficial material goods offered like the septuacentennial cupcake-in-a-cup but then it got me thinking about what I prefer in terms of brand and quality. I want the very best version of a movie if at all financially possible. But why am I willing to put money behind a brand (e.g. The Criterion Collection) if it means burning a hole in my wallet? I guess it’s more about the prestige of having a high-end version of a film on my shelf (more so if I get it autographed if the opportunity arises). Considering it’s position in the Pixar chronology, it’s a solid installment in the post-Cars era and makes up a trilogy of great films (Ratatouille, this, and Up). I’d rather have all three of those films make the list but alas, it was this one. Not that I utterly dislike this particular film but it’s more in the upper half of my favorite Pixar films. At least it’s comforting to know that VHS tapes will still work seven hundred years into the future. Looks like yellow is the new black, according to these prisoners. Just wanted to make that joke before I forgot. I guess you had that thought as well if you’ve seen at least this picture or any of them in prison garb. An eclectic group of beings band together try to stop the end of the world. After seeing the trailer, I figured it was one film I should see over the summer just because of how fun it looked. Since then, I realized that I didn’t want to see it in a traditional theater, but rather the drive-in. I went last night as a way of treating myself to one of the few final moments before summer’s end. It was doubled with Into the Storm but I suppose it was worth the wait, especially after I found out that this was to be shown on film. It made the overall experience very enjoyable. I must confess that I am not literate with the comic book world, whether it’s Marvel or DC. The first and last superhero film I saw since the boon of superhero films was The Avengers, only because I knew Joss Whedon. I’ve listened to friends discuss these movies many a time, only to be left out as a passive listener. I know I have some catching up to do, but that will have to wait. What we have is a film that’s tongue-in-cheek; it knows that it’s not supposed to be serious all of the time, especially when you have a crew that includes a raccoon and a talking tree. I came to this movie knowing this and was not disappointed. The pop culture references, whenever presented, mostly hit their mark. I know some art buffs were in the audience that night when Peter Quill talked about how dirty his ship is. It even has time to at least address each of the Guardians’ backstory. While the stories are not presented in the same way, each one is touching in some way, all connected through loss. I’m sure they’ll work their way into the sequel at some point, at least for those who don’t read the comics. I wish each one had equal screen time, but that would’ve slowed the pace. As for the characters, I figured all would have at least an equal or proportionate share of screen time. Speaking as an outsider to the Marvel universe, I didn’t fully understand why Gamora’s sister wasn’t explained as well as Gamora herself. To that extent, it seemed like she was a mini-boss before the final battle. Same with Thanos and The Collector. With Rocket Raccoon in particular, I felt that he was definitely present in the same space as the actors. In recent times, the CGI characters in live-action movies have lacked a certain weight, mostly though minor exaggerations in movement and the fact that it was composited into the scene. Here, I felt like I could interact with him if it were possible, despite him being a CGI character. This is a good thing. I was worried that the editing during the action sequences would be an incomprehensible mess. No worries here. I was able to follow most of the action and still make it out in one piece. That’s a success in my book. Some scenes were a little dark in terms of lighting. I think the projector bulb was not at full power but there were moments where it was hard to discern things on screen, regardless. It’s a small peeve of mine but the moments were brief. I enjoyed watching this, even if I went alone. I am eager to watch the sequel when it comes out in a few years. It’s a blockbuster that helps end summer on a high note. In the meantime, I’ll have to catch up with Marvel. P.S. The post-credits scene is worth watching, if nothing for the pleasure of seeing someone from the Marvel universe be recognized again. Today, it’s another birthday for me. I figured it was time to watch another movie that was released on this special day; this is one of them. Also, today happens to be M. Night Shyamalan’s birthday. I’m not sure if that’s a blessing or a curse. A psychologist helps a kid confront his fears. This was my first (and, so far, only) Shyamalan film. I saw this for the first time last year and returned to it today. I had heard the criticisms about his recent films and reportedly how terrible they were. I had my doubts when I saw this had placed on the AFI Top 100 for 2007. Keep in mind that this wasn’t spoiled for me. My first time through, I thought it was a slow film that, once I knew the twist, was another box ticked off my list. It wasn’t until I pored through the bonus features that there were a lot of things I missed, specifically the use of color. The second time around, I saw the signs and gained a better appreciation for them. The story’s tight, but what about the cinematography? It’s very deliberate but treads close to being pretentious. The slow pan during the “pendant” conversation, while somewhat visually engaging, seems to ask for a series of over-the-shoulder shots by the end just to break up the mundane nature of the scene. At the same time, the shot length complements the atmospheric feel of the film. As for the film’s legacy, I figure it has had its fifteen minutes. From what I remember as a kid, my friends would say “I see dead people” without meaning. I knew it was from the film but I wasn’t sure how it fit. I dismissed it as one of the plainest quotes. As time went by, the quote was parodied to the point that when I saw it in context, the power was diminished. Come to think of it, all of the people I know of who talk about this film only mention the quote and nothing more. It’s like knowing who or what Rosebud is, protecting the spoilers. Not exactly thought-provoking. In the end, I believe that this is a well-crafted film that holds up today. Even though it doesn’t rank high on the AFI Top 100 or my personal favorites, it’s worth a few viewings that are worth your time. Since the release, I’ve heard nothing but praise for this film. Problem was, I never had the time to see this in the theater. My friends have said I needed to see this film. So yesterday, I went to my library to pick up some movies. As soon as one of the staff put this film back on the shelf, I immediately snagged it and went home. A concierge has to clear his name after being framed for murder. So, I sat down and started the movie. I was pleasantly surprised to see a viewing recommendation for this film (widescreen) before it began. Usually, these kind of notices from the director are for the projectionists, such as this for Mulholland Dr., or in art galleries as part of an installation. Still, I didn’t have to worry as the flatscreen was already set for the film. Now, it might have been that I saw this alone or that I had heard a lot of hype, but I thought it was decent. It wasn’t the full perfect ten or four/five star film that I heard it was. It had everything that a Wes Anderson movie has but I left wondering what the point was. For starters, I would’ve used only two timelines, not three. Right off the bat, it started to enter Inception mode with the girl reading the book, which is about an author who meets a guy who recalls his story about the hotel. At the end, I forgot that this was only a book. It helps that the aspect ratios change with each timeline. I sat down with the idea, literal-minded as I am at times, that the film would solely focus on the hotel, its visitors, and the quirky situations that would take place there. I was partially right. I’m not saying I was disappointed in my assumption but that I didn’t expect the movie to go in the direction that it did. Entertaining, sure. Personally, I thought there were too many characters. True, most of the story is focused on the concierge and lobby boy, but when you have to keep track of nearly twenty other people with varying roles, it becomes tedious. Even if I had a cheat sheet, I’d still have trouble. The set design is stunning, as usual. I felt like the hotel could actually exist and wanted to explore the interior as a whole. I would reserve a room just so that I could live there. It seems like the nicer and less haunted version of the Overlook Hotel. Funny if Jack Torrance ended up there. If you’ve seen any stills from the film, it lies mostly in the red/purple range with some soft blues here and there for the hotel’s timeline. There’s rarely any green in this film. Seriously, try to find some. Overall, it’s worth a visit but by the end, you may need to book another room at another hotel to catch your breath. Also, could someone explain how this movie can be R in the States but G elsewhere? That’s what it says on the back of the case.